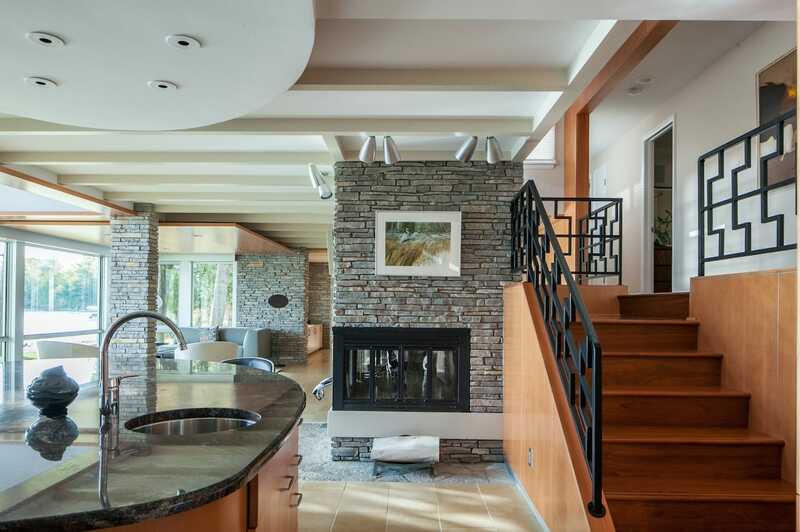 A contemporary remodel helps an old Glen Lake home with a modern soul embrace its sparkling setting. 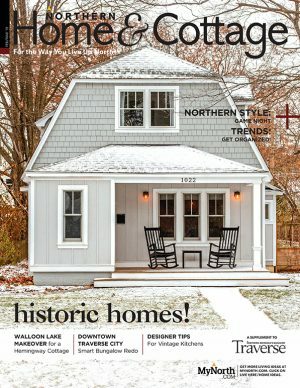 This home is featured in the February 2017 issue of Northern Home & Cottage, a bi-monthly home publication included in all subscriptions to Traverse, Northern Michigan’s Magazine. Subscribe. 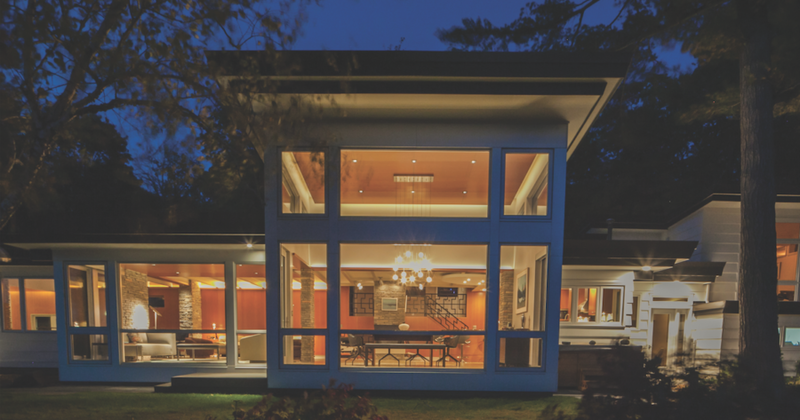 Midcentury modern architecture is enjoying a strong revival. The style’s simplicity and emphasis on function over ornamentation speak to a new generation looking for calm in a complicated world. But in the 1980s, more was better, and many of the quietly dramatic modern houses from the ’60s met their demise—replaced or remodeled beyond recognition. 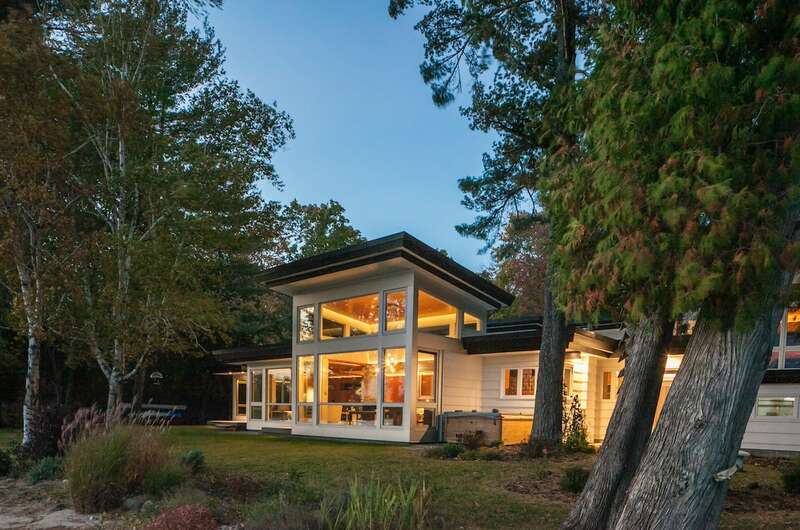 In 1985, John Hoagland saw potential in the Sixties Mod lake house he’d just purchased next to his parents’ Glen Lake home. The place came with original turquoise appliances, shag carpeting, and a few pieces of furniture by iconic designers like George Nelson and Charles Eames. After two renovations, the home now stands as a respectful and contemporary adaptation of its original style. The first renovation expanded the kitchen, master suite and garage. Then in 2014, Ray Kendra of Environment Architects designed another small addition and gave the whole place a refreshing update. His main objective was improving the original house by capturing more of the sky and engaging the water. 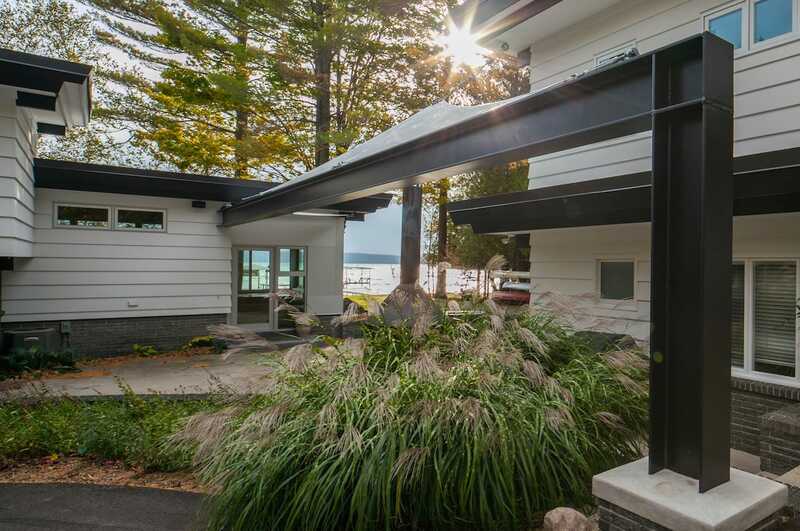 The home now reaches just a little closer to Glen Lake’s brilliant shores, and expansive aluminum-framed windows flood the living space with southern light and blue-water views. Waning autumn sunlight washes over a cozy entertaining nook as John and his wife, artist Shirley Hoagland, talk about this being their favorite time of year. As the only year-round residents in their Big Glen neighborhood, they love the tranquility that arrives as their snowbird neighbors close up and head south. 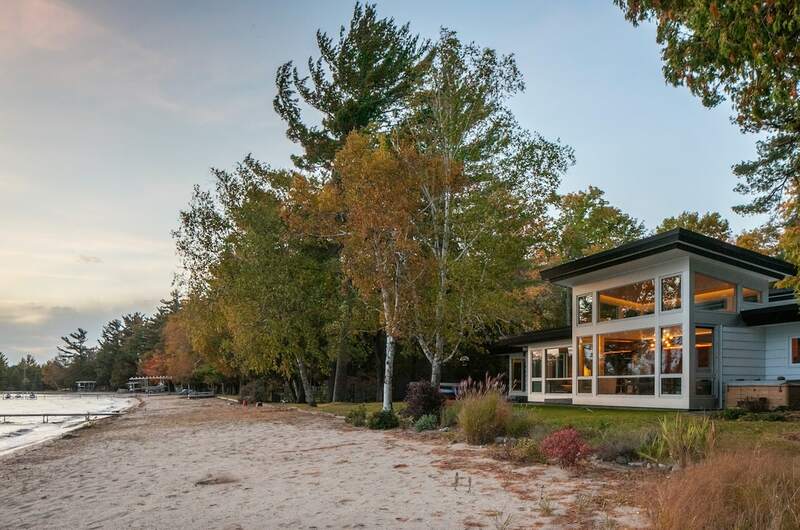 The calm is conducive to focusing on work, important for John, who runs several businesses from the cottage-turned-office connected to the main house by a sculptural steel beam. Shirley loves watching the lake colors shift daily, the watery blues changing more dramatically in winter. What hasn’t changed is the modern sensibility of the house. Crisp lines still rule, and the recent update accentuates them with straight-grained Douglas fir paneling and cabinetry, rectangular limestone flooring, metal accents. “We had to respect what we were working with,” Kendra says. Kendra speaks of an easy collaboration with John, who had strong ideas about the forms and exterior of the home, and Shirley who had a strong vision for the interiors. “It’s really fun to work with people who are so open to thinking out of the box,” Kendra says. 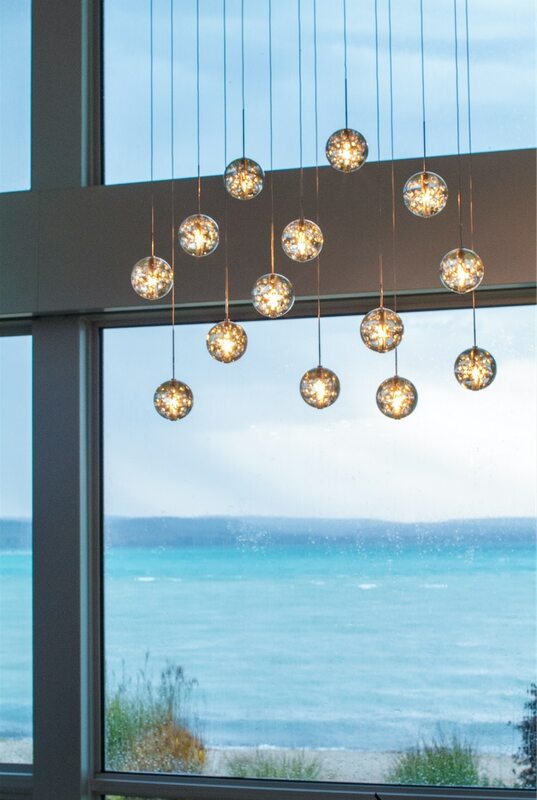 Lighting throughout the space is soft and indirect, making winter’s short days more appealing. The design is accomplished with a mix of floating ceilings, low-profile metal coves, and textures that cast a diffused glow. The homeowners can control light, heat and sound using a smartphone app—a welcome anachronism in the 50-year-old home. Another high-tech upgrade is a flat screen TV that sinks into a sleek cabinet at the press of a button. As 21st-century modern as it is, the house still shows its vintage proudly. Private spaces remain small, and features like built-in dressers and a peninsula fireplace give clues about its age. John updated some of the original spun-aluminum bullet light textures with LED bulbs. 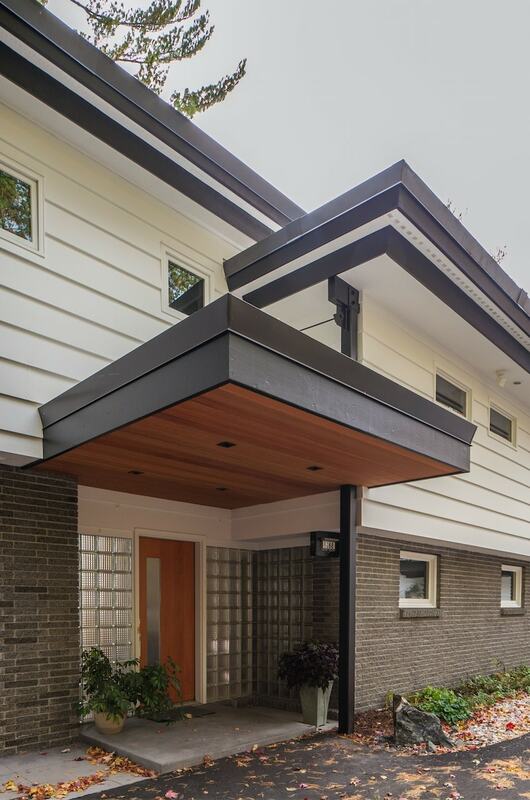 The entrance door on the first addition sits within glimmering banks of glass block—a fitting welcome from a house with a ’60s soul. In the kitchen, Shirley chose a glass backsplash that draws from the same materials palette, but in a contemporary way. The renovation balances elements from the original era with updates that are clearly modern but evoke the same design philosophy. 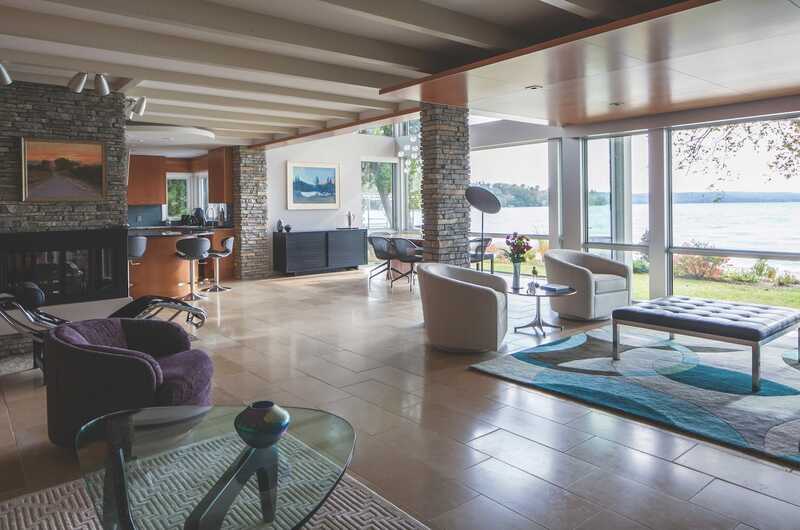 The shag carpeting and turquoise appliances didn’t make the cut, but the vintage furniture—much like its second owners—still lives contentedly in its sleek home on the lake, all year long.